Do you know what QuickMapsAndDirections is? QuickMapsAndDirections, or Quick Maps and Directions, is a potentially unwanted program that works as an extension on Google Chrome and Mozilla Firefox browsers and that is installed as an application for Internet Explorer users. The program was created by Eightpoint Technologies Ltd SEZC and Polarity Technologies Ltd., and the latter company is very well-known by our research team. It is the company that stands behind Search.searchlen.com, Search.searchlttrn.com, Search.yourpackagesnow.com, and many other infamous hijackers. Most of them are linked to unique extensions that are set up to trick users into letting the hijackers in. In our case, Search.hquickmapsanddirections.com is the hijacker we are dealing with. The good news is that, all you need to do to get rid of this hijacker is to remove QuickMapsAndDirections from your browser or uninstall it from your operating system. If you need help deleting this PUP, keep reading. The hijacker of QuickMapsAndDirections presents easy-access links to Google Maps, Bing Maps, Gas Prices, Yahoo Maps, and Satellite Maps, but that is not a very useful service, considering that you can easily add all of these sites to your browser’s bookmarks bar for easy access. Besides this, one of the buttons presents the installer of Search Encrypt, which also pops up after you install the extension. If you have downloaded this additional offer, do not forget to remove it too. It is not as reliable as it might seem to be at first. Of course, because QuickMapsAndDirections also displays links that route to Amazing, Audible, Facebook, Youtube, and other popular sites, you might let some things slide. Well, you shouldn’t. 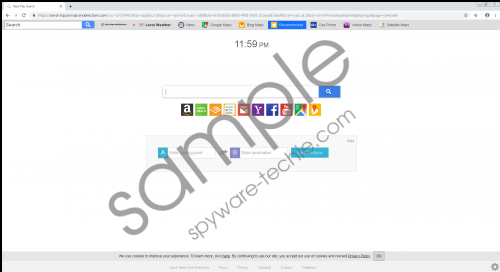 The PUP does not offer a reliable service, the search tool redirects to Yahoo Search and shows unreliable, modified results, and tracking tools are set up to collect information about you while you are online. It is strongly advised that you delete QuickMapsAndDirections and Search.hquickmapsanddirections.com from your web browsers. One option you have is to take care of that manually, using the instructions below. Note that we also added steps that show how to clear browsing data, which is how you can eliminate data trackers. Another option is to install an anti-malware program that would find and delete the PUP’s files automatically. This is a great option if other threats were downloaded along with the PUP and, also, if you need a reliable security tool to help you guard your operating system and browsers in the future. Launch Chrome, tap Alt+F, and select More tools. In the expanded menu click Extensions and then Remove the undesirable add-on. Tap Ctrl+Shift+Delete to open the Clear browsing data menu. Choose the time range at the top, mark boxes, and click Clear data. Launch Firefox, tap Alt+T, and select Add-ons. In the Extensions menu Remove the undesirable add-on. Tap Ctrl+Shift+Delete to open the Clear Recent History menu. Choose the time range at the top, mark boxes, and click Clear Now. Open the Control Panel (via Start/Windows menu or Run). Navigate to the Uninstall a program menu and Uninstall the undesirable application. Launch Internet Explorer and tap keys Ctrl+Shift+Delete. In the Delete Browsing History menu check the boxes and click Delete. Even though QuickMapsAndDirections looks pretty harmless, this extension/program might hijack your browser’s homepage, redirect your searches to a popular search engine just to expose you to modified results, track your activity, as well as introduce you to the installers of other suspicious extensions. Without a doubt, it is our recommendation that you delete QuickMapsAndDirections as soon as possible. If you are not ready to follow the manual removal instructions above, you should install reliable anti-malware software to get rid of the potentially unwanted program automatically. This is the best option in any situation, and if you install reliable software, we recommend keeping it updated to ensure that you are guarded 24/7. Tags: delete QuickMapsAndDirections, QuickMapsAndDirections, remove QuickMapsAndDirections.